So…Valentine’s Day is actually one of my least favorite holidays. I feel pressure to participate in the cheesiness even though cheesy feels so uncomfortable to me. Luckily, my husband isn’t really into Valentine’s Day either. Since it’s almost the big red day, you’re probably seeing lots of lists of “the best romances, etc” around the bookish internet. Here’s what bugs me about traditional “romances.” The predictable (no matter how unrealistic) happy endings, the cheesy dialogue, the equally cheesily written love scenes. Shall I go on? I promise, you won’t find those elements in these unconventional love stories. 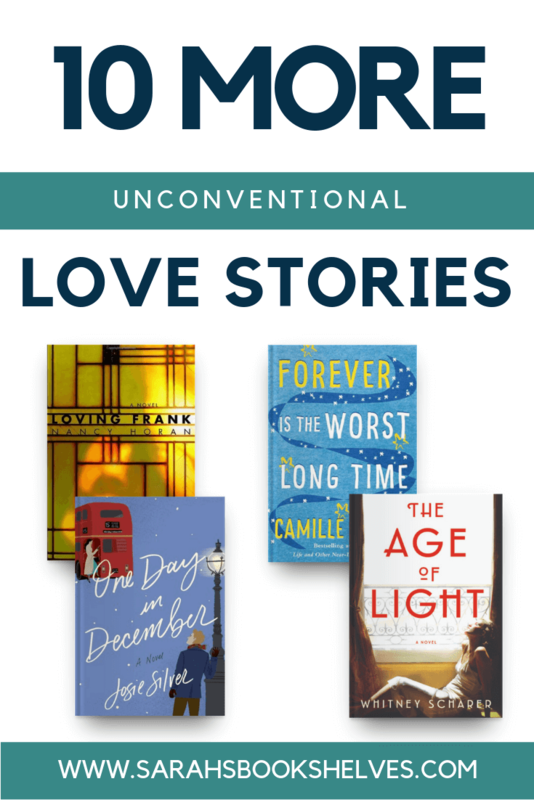 Most readers probably wouldn’t even call these love stories. But, I do and they’re the kind I prefer. 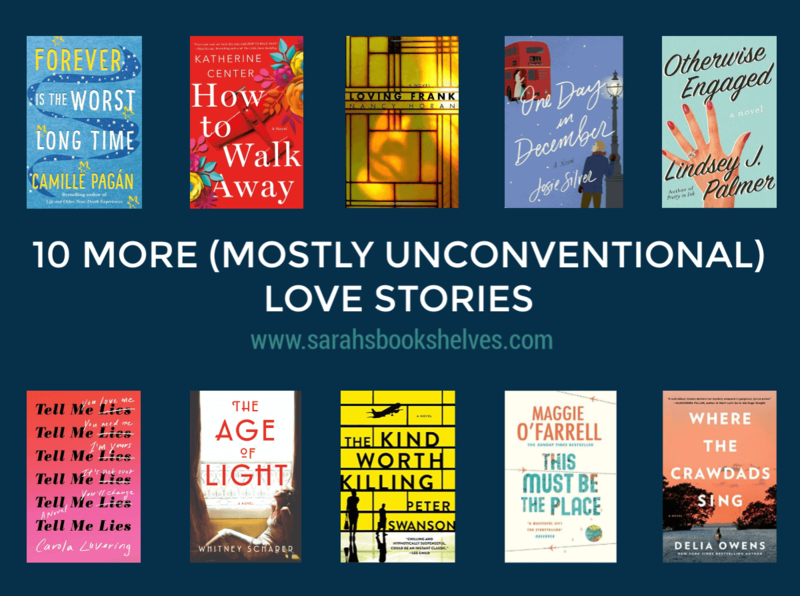 Last year, I shared a list of 12 unconventional loves stories for people who don’t like traditional romances. As I thought about Valentine’s Day 2019, I realized I had a lot of new books to add to this list. So, I bring you 10 new love stories…a few of the more conventional variety, but most unconventional. You’ll start out thinking this is a run-of-the-mill love triangle, but it goes in a direction you probably wouldn’t guess. This love story is more traditional and feels like a rom-com…but, for some reason all that didn’t turn me off! Based on the real-life affair between the architect Frank Lloyd Wright and Mamah Borthwick Cheney, Wright’s married client. Beyond the tempestuous love affair, this is a story about Mamah finding her own identity outside of love. Another more traditional love story featuring a love triangle, but its intriguing premise kept me interested. Yet another more traditional love story with an intriguing premise. Mini review coming next week. A sociopathic love story…and I can’t say this one is happy. It’s more of a cautionary tale. Similar to Loving Frank, a novel based on the real-life love affair between former Vogue model Lee Miller and artist Man Ray. It’s out coming out today and I’ll have a mini review for you next week! Are you wondering why I have a thriller on this list? There’s a bit of a love story mixed in here too…a really messed up one. A family drama / love story…involving a Hollywood actress that the world had presumed missing and an American divorcee on the run from his problems. A coming of age story, a murder mystery, and a love story wrapped up into one…with some beautiful nature writing thrown in. Some would call this love story horrifying. I definitely did at times. But, it’s also different than anything I’ve ever read and Greenwood makes you question what you thought were your rock solid convictions. What happens to a love story when a husband of only a year and a half goes to prison? Oprah sure wants her book club members to find out! Most people probably wouldn’t consider this sci-fi page turner a love story. But, ultimately, Jason is fighting tooth and nail to be with his wife and child…his idea of home. An illicit affair between a British heir and his neighbor’s maid. It definitely doesn’t have a happy ending, but I finished the book completely satisfied. Two older people (Louis and Addie) stop caring what everyone else thinks and do what they need to do to be happy. It’s sort of like they read The Life-Changing Magic of Not Giving a F*ck by Sarah Knight. A love story where the two lovebirds are totally messing with each other and you have no idea who will come out on top. This is the kind of love story that many of us had in our youth (especially if you lived in NYC) and look back on with horror. We wish we would’ve been stronger, smarter, and valued ourselves more. It’s raw and most definitely not sweet. A story of friendship, unrequited love, desperation and obsession. This one will make you uncomfortable…I was cringing often. Probably the most F’d up love story you’ll ever read (with a love story you can actually root for buried amid the horror)…starring a supremely dysfunctional family. Love permeates this story about family and magic. Can the Owens children find love? Should they? The true love story of this book isn’t the one you think it will be. A classic “wrong side of the tracks” love story…told in a raw, gritty, edgy, and uncomfortable way. How do you feel about romances? Do you prefer the traditional or unconventional type? Our Souls at Night…..I still think about that book. I think it is a perfect rec for this post!!!! This list is totally for ME!!! I don’t usually read any romance, and I’m generally not a big fan of the romances that make it into the types of books I do read. SWEETBITTER and SUNBURN are 2 that I’m definitely interested in… and I’ve always been curious about DARK MATTER. Thanks for the recs!! Yay! A decent number of romance anti-fans are coming out through this post…love finding my tribe! I think there’s a difference between a love story and a romance and I enjoy the former but not the latter. All the Ugly and Wonderful Things is certainly unconventional. I need to check out the others on your list. I completely agree. I consider “romance” more the genre. 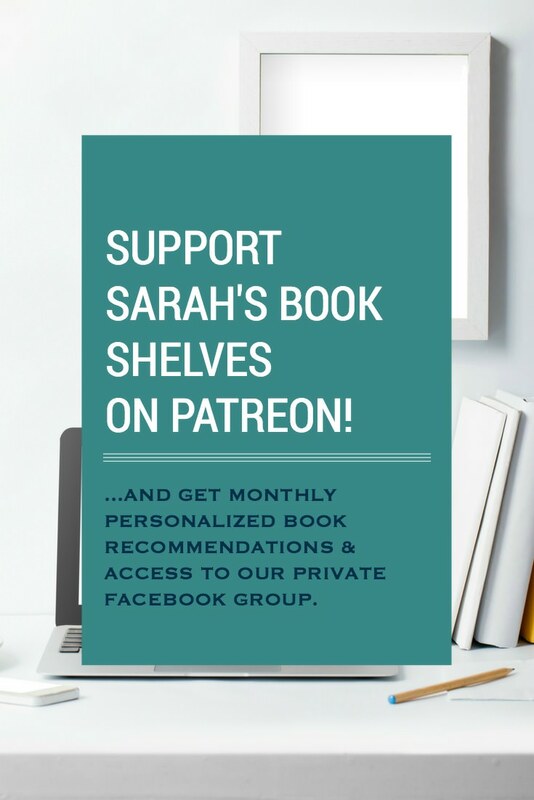 So many great titles here, Sarah! Funny that you mentioned Dark Matter. All through that one I kept thinking. Wow. She must really be something. He really, really loves her! It was like she had cast a spell on him or something. I know, right?! All that risk just to get to her? Totally agree with Dark Matter! I went into it thinking it was going to be all sci-fi, and it really was so much more than that. Yep – which is probably why I liked it, since I don’t normally like sci-fi! What a great post idea. I wish I’d thought of it! Love the dark titles you included, like Sweetbitter, Roanoke Girls, and White Fur. Those are the sort of love stories I really enjoy. Your list makes me want to read Sunburn and Mothering Sunday even more. Oh my Lord…bless you tomorrow! Ha, the husband and I don’t like Valentine’s day much either (though I kid him it’s so he doesn’t have to buy all that expensive jewelry they show on the commercials). We used to share a box of good chocolates, but don’t even do that anymore as we’re eating healthier. I like a good love story if the rest of the plot can hold up on its own, so these are interesting choices for me. I read Dark Matter and really got ito it! A few of the others are already on my radar to read someday and a few new to me. Thank you! A box of chocolates sounds perfect! And – great point – the story has to hold up without the love part. Like the story could take it or leave it. I don’t read much romance these days. I used to read more of it. We’re not big Valentine’s Day people either, though we did get engaged on Valentine’s Day 1980. He cooked me dinner and then went off to a night class. He was still in college. I went to go tell my folks about the engagement. Ha! Good notion that Dark Matter is a love story of a sort. It is. That’s the only one of these that I’ve read. We’re not big on V-Day either. I like your “alternative” selections. Sweetbitter is one of my favorite books of the last few years. It’s a really unique book…wasn’t what I expected. And – it’s super short, so try to work it in! I already have four of these on my list! I’m going to take a look at the others. Very creative post! I agree with your short descriptions of each book that I have read. The way you wrote about Roanoke Girls it makes me feel less guilty about actually enjoying the book. (Minus the messed up parts, of course). I haven’t read any of these, but have been wanting to read Dark Matter for some time now. Excellent twist on the theme. I honestly hate Valentine’s Day. The rest of the year, I’m totally happy and cool with being single and I don’t really want a boyfriend, but then you get to Valentine’s Day and everything’s all lovey and mushy and you can’t help but feel a little ignored and annoyed! YAY for Sweetbitter! That one is definitely holding up as a favorite of mine; I still see it around quite a bit, even though it’s backlist now. I read 6 of these. Loved two: Tender and Roanoke Girls. Despised White Fur and Bittersweet. Wasn’t in love with Dark Matter either. I might try the Graham Swift. Liked his “Last Orders” (which is surprising as I believe it won the Booker, and Bookers don’t usually agree with me). If we’re throwing in our own I’ll vote for “The Last Cowboys of San Geronimo.” I don’t think it hit the national radar; it’s a Bay Area (Marin County) story. Haha – 100% agree about that Hallmark holiday! White Fur and Bittersweet were both really polarizing…I remember reviews being either extreme love or extreme hate when both came out. I haven’t read Last Orders…need to try it! And Bookers are generally no-go’s for me too. Will check out Last Cowboys! I think you’re probably not alone! I certainly was embarrassed that I liked it, but couldn’t stop reading! The books I’ve read on this list I loved so much that I feel like I need to move the others up my TBR. I really need to finally read Dark Matter soon I think. I need my library holds to start moving! I love a good unconventional love story. All the Ugly and Wonderful Things is one of my favorites. I also finally got around to reading Mothering Sunday. I love Swift’s writing. It’s so evocative of the time and setting. An American Marriage is on my TBR stack right now too. Wasn’t it great?! So unique I thought. And I think you’ll love American Marriage. Chose “An American Marriage” for my book club pick in March. It’s the closest I could get to a “romance” novel. My book club has complained, nicely, about the darkness of my choices in the past (No Country for Old Men for example). I think “An American Marriage “will make for some good discussion. Love everything by Kent Haruf. And now I have a whole list of books to read! Haha! My mom always complains about the dark books I talk about on my blog, so I’m right there with you! For some reason, I like dark in my reading! And, I’m eager to read more by Haruf. What should I try if Our Souls is the only one I’ve read? Mothering Sunday!! Our Souls at Night. Wow! You picked two of my very favorite recent books. If desired, here’s a link to my reviews. I love it when I find bloggers who loved the same books! Unconventional love stories are the ONLY way to go. Fun additions to your list and quite a few I need to read…The Kind Worth Killing, Tell Me Lies. Unconventional love stories are my favourite kind – I can’t stand the cheesiness either – so thanks for sharing these!